The Samuel Freeman House is one of three textile block houses designed by Frank Lloyd Wright and built in the Hollywood Hills in the 1920s. 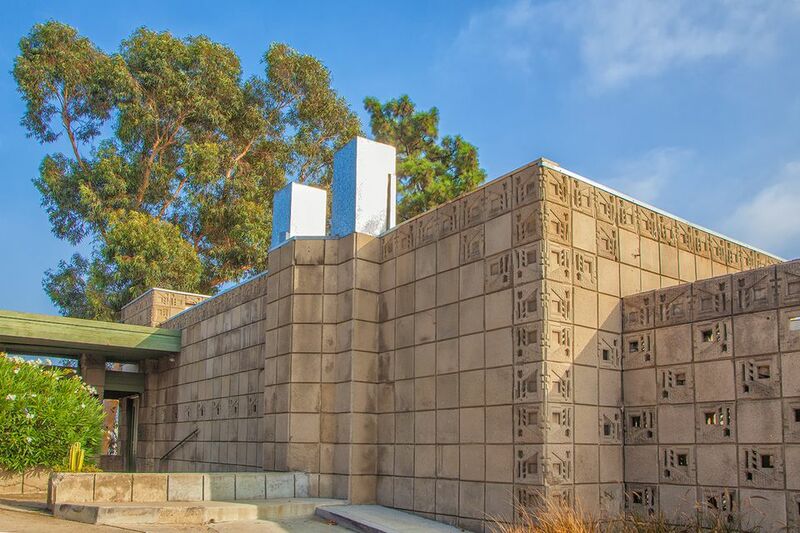 It was constructed in 1923 for Samuel and Harriet Freeman, two members of the Los Angeles avant-garde. They met Wright through Aline Barnsdall, who owned Hollyhock House. The Freemans asked Wright to design a home for them with a budget of $10,000. He seized the opportunity to create a concrete block house based on a 16-inch square that was estimated to cost $12,000. In a story that played out over and over again between Wright and his clients, the final bill was $23,000. According to the USC School of Architecture (who now own the property), the Freeman House is among Wright's most interesting and enchanting small residences. Some people say its living room is one of his best rooms anywhere. The Freemans lived in the house from the 1920s virtually until 1986 when Harriet Freeman donated it to the University of Southern California. It was a center of avant-garde artistic and political activity, with visitors that included photographer Edward Weston, Martha Graham, architect Richard Neutra, bandleader Xavier Cugat, and actor Clark Gable. From the street, the Freeman House appears to be a single story, but it descends two more levels down its sloped lot. While it may be bigger than it looks from the street, it's the smallest of all Wright's textile block homes at about 1,200 square feet. It has an entrance, a living room, and kitchen on the main floor, with two bedrooms, a lounge, and a bath downstairs. The house was built with little support in the way of reinforcement or beams, probably not the best of ideas for a house on a hillside in earthquake country. The university is working to restore severe damage from earthquake and water, but repairs are costly, and progress has been slow. They hope it will eventually be a residence for distinguished visitors, and a setting for small salons, seminars, and meetings. Some people think the Freeman House block design looks a little bit like flowers. They are 16-inch squares. Some of them were perforated and glazed, allowing additional light into the house. The Freeman House is located at 1962 Glencoe Way, Los Angeles (Hollywood), CA. It is not currently available for tours (although you might stumble upon an out-of-date page on the USC website that suggests otherwise). You can take a look at it and see more drawings at Wikiarquitectura, and you can see part of it from the street. The Freeman House is one of nine Frank Lloyd Wright-designed structures in the Los Angeles area. It is also one of Wright's designs which is on the National Register of Historic Places. Others include the Anderton Court Shops, Hollyhock House, Ennis House, Hanna House, Marin Civic Center, the Millard House, and the Storer House. Wright's work isn't all in the Los Angeles area. The San Francisco area is also home to eight of them, including two of his most important works. You'll also find several houses, a church, and a medical clinic in some of the most unexpected places. Don't be confused if you find more "Wright" sites in the LA area than are mentioned in this guide. Lloyd Wright (son of the famous Frank) also has an impressive portfolio that includes Wayfarers Chapel in Palos Verdes, the John Sowden House, and the original bandshell for the Hollywood Bowl. If you're an architecture lover, visit famous Los Angeles houses that are open to the public, including Richard Neutra's VDL house, the Eames House (home of designers Charles and Ray Eames), and Pierre Koenig's Stahl House. Other sites of particular architectural interest include the Disney Concert Hall and Broad Museum in downtown Los Angeles, Richard Meier's Getty Center, the iconic Capitol Records Building, and Cesar Pelli's boldly colored geometric Pacific Design Center.